Southampton defender Virgil van Dijk. Photo credit: Martin Rickett/PA Wire. Liverpool made it through to the Champions League group stages last night - and now the club need to back Jurgen Klopp with a couple of big signings ahead of Thursday's transfer deadline. There may be one or two players who will now be tempted to make a move to Liverpool in the knowledge that a place in the group stages of Europe's elite competition is secure. In addition, the club now know that they have an extra windfall of £40m and more rolling in so they can spend over the odds to get players with that extra cash and it has to be done. You look across Stanley Park at Everton and they have worked the transfer window perfectly this summer, signing some decent players with the £75m they got from selling Romelu Lukaku. New signings add a bit of excitement for the fans and they also freshen up a dressing room, bringing a bit of competition for places and focusing a few minds. So far, you would have to say that Everton are an example of a club that have had a good transfer window, with Wayne Rooney and Gylfi Sigurdsson good additions and the signing of a top striker all they now need to complete their jigsaw. Then you look at Liverpool and it is hard to get away from the fact they have had a bad window so far. The players they have brought in should represent good business, with Mohamed Salah a decent addition from Roma, Dominic Solanke a good prospect and Andy Robertson looked good on his debut against Crystal Palace on Saturday. Yet the group of players Klopp has at his disposal now that he has added six big Champions League matches to his schedule is not enough, we can all see that. When you consider he has a few too many injury prone players in his squad - including Daniel Sturridge, Adam Lallana, Jordan Henderson - he will simply not have enough numbers to rotate his squad unless he gets more bodies in. Yet we don't want to see Liverpool signing second-rate players in the next few days. Good quality players need to come in and they will be hard to find because let's be realistic here; who is going to sell their best players in the final week of the transfer window? Liverpool supporters might not like the answer to that question because I can see a scenario where a succession of bids for players fail and Klopp ends up going into the season with the squad he has now. The manager said last week that he didn't need any more signings and I suspect he said ju st in case the club fail to get any of his targets and that has to be a real possibility. 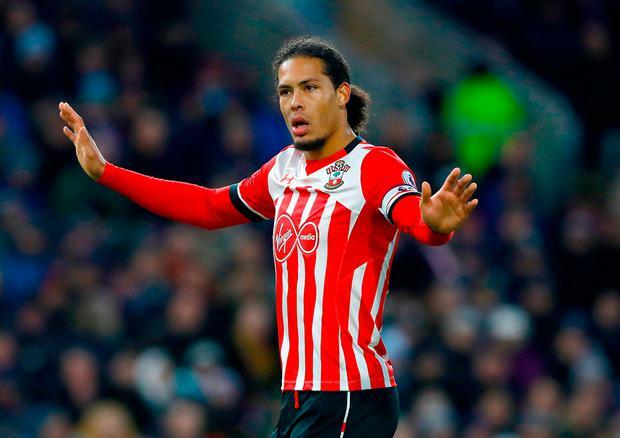 In an ideal world, the deal to get Virgil van Dijk out of Southampton could be revived and their signing of a Dutch international defender Wesley Hoedt suggests they may be covering themselves in case their 'on strike' centre-back leaves. Liverpool appear to have made a bit of a mess of their initial approaches for Van Dijk, with their apology to Southampton for speaking to the player without permission appearing to have soured relations between the two clubs. Yet there comes a point when a player who is causing too many problems at a club needs to be removed and with Van Dijk making it clear he wants to leave, there may be room to strike a deal if a buying club pays over the odds. Van Dijk's situation is very different to that of Liverpool midfielder Philippe Coutinho, who wants to go to a massive club in Barcelona and we can all understand why. If Coutinho comes back into the Liverpool fold once the transfer window closes, I don't think the players, the manager or the fans will have a problem with him, but you wonder if that is the same story with Van Dijk at Southampton. Van Dijk is at loggerheads with his employer and that is not a healthy situation. I can see something breaking there in the next few days and a transfer happening. Whether Southampton would sell Van Dijk to Liverpool after all that has gone on this summer is another matter, but they should certainly make an offer in the next few days just to test the water. You would hope that the people working at Anfield to secure transfers would have a few more irons in the fire. Whatever Klopp might say publicly, he knows he needs to sign a top centre-back and a player who can offer something in the heart of the midfield to give Liverpool a chance of winning trophies this season. The moment has come for Liverpool to splash the cash and make some big signings and all involved in the club's transfer negotiations appreciate they need to deliver now.